Donna J. 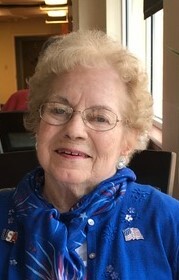 White (81) of Beloit, passed away on Friday, April 5, 2019, at Alliance Community Care. Born in East Liverpool, Ohio on August 10,1937, the daughter of the late Donald and Martha (Hendricks) Allen. She was a homemaker and a Rubbermaid Regional Manager and sales representative for many years, as well as working at Nancy's Fashions. Donna also helped her husband Fred, whom she married on December 27,1954, and helped to maintain the family farm. Donna was a member of the Damascus Friends Church, and the Friendship Sunday school class, where she taught Sunday school and helped with the church youth group, and volunteered her time wherever needed. Donna enjoyed baking, gardening, canning, freezing, crafting, word find puzzles and playing cards. She loved taking photos, but most of all, she loved taking care of Fred and her family. She also enjoyed her winters in Florida, as well as traveling with Fred. She will always be remembered for her wonderful smile and her ability to make you feel so welcomed in her home. If you stopped in, she insisted you ate something or took something home to enjoy later. Survivors include, a daughter Teresa (Tom) Dutcher of Salem, a daughter Nancy (Paul) Rosen of Huntington, New York, a grandson Michael Goughenour of Salem, step grandchildren Kristen Dutcher and Robert Dutcher both of Salem, brother Chris (Virginia) Allen of East Liverpool and sister Sheri (Chris) Bowman of Lisbon. Besides her parents, she was preceded in death by her husband Fred, son Frederick “Freddie” White Jr, a sister Carol Ann Oliver, and a brother Wayne Allen. Donna has fought the fight and is now home and healed with Fred and her son Freddie. She will be missed by all who knew and loved her. A Funeral Service will be held on Tuesday, April 9, 2019, at the Damascus Friends Church at 12:00 PM with Pastor Rick Brendlinger officiating. Visitation will be held on Tuesday at the church from 10:00 AM to 12:00 PM. Burial will take place at Damascus Cemetery. Memorial contributions can be made to Alliance Hospice 2461 W State St, Alliance, OH 44601 and Damascus Friends Church 28857 Walnut St, Damascus, OH 44619. Friends and family can send condolences and sign the guest register online at www.grfuneralhome.com. Arrangements are by Gednetz-Ruzek-Brown Funeral Home, Sebring, Ohio (330) 938-2526.